This year for Heritage Open Days, we had the pleasure of throwing an event celebrating Warwickshire’s Land Girls, to accompany our exhibition ‘Warwickshire’s Land Girls: The Food of Love’. Our project began earlier on this year when we were lucky enough to interview eight local Land Girls who worked on local farms during World War Two. Lovely stories began to emerge of cherished memories, lifelong friendships & relationships and an affinity with the land that stayed with them forever. We were so inspired by their stories that we wanted to throw a very special event to honour them and to say thank you for their invaluable contribution to the country during the Second World War. Around the same time as we began interviewing our Land Girls, our Stitch Group were donated a World War Two parachute dress. The group loved hearing the stories the Land Girls were sharing with us and decided that the dress would be embellished as a tribute to them and their hard work. 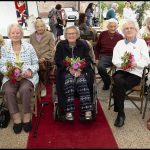 Our wonderful weekend plans started from here: we decided that the main event would be a World War Two wedding and our volunteer Rosie Ryder quickly agreed to be the bride. With our youth volunteer Bill Jones agreeing to be our groom, events volunteer Mark Ewins accepting the role of the vicar & our volunteer gardener Paul Mitchell playing the role of father of the bride, the wheels were in motion! We began Heritage Open Days with a march across the Bancroft Gardens, singing songs and handing out leaflets to passers by promoting the event. We were joined on the march by members of the public who walked all across Stratford with us, before making our way back to the Slaughterhouse for the wedding to begin! Meanwhile, at the Slaughterhouse, our Land Girls were arriving and people were beginning to take their seats in the outside chapel. Rosie Ryder, our bride, was hiding upstairs in the wedding dress, as she awaited the groom Bill and father of the bride Paul to return from the march. She had spent the morning at NashWhite Hair getting her hair done for the event in true 1940s style. Once everyone was seated, Paul and Rosie walked down the aisle to the Wedding March, played beautifully by Martin Foster. Mark gave a rousing introductory speech as vicar and the Land Girls were all given flowers to hold, as the bridesmaids, in the front pews. The couple said their vows and were announced to be married, to the delight of the audience who had gathered around. Following the wedding, the Land Girls were treated to afternoon tea and a chance to catch up and share their stories. After tea, Second Thoughts Theatre performed a piece called The Forgotten Army, which was inspired by conversations with real Land Girls. There was laughter and there was tears and we were all very emotional when the end of the day came and we had to say goodbye. 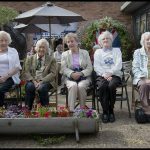 The day was filmed by Chris Bradley, who had some wonderful chats with the Land Girls and captured all the special moments throughout the day. The second day was also filled with fun! Second Thoughts theatre were back for another emotional performance of The Forgotten Army. It was so wonderful to have the girls with us, they captured everything the Land Girls told them, from singing in the fields, to the hard work, to the American soldiers, which all brought wonderful memories back for our Land Girls. We also held an entertaining World War Two Bake Off, which saw Molly Allen demonstrate cake decorating for eight lucky contestants. A big congratulations our winner, who faced stiff competition from her daughter and our very own Karen Williams! 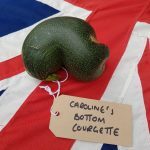 Caroline Abercrombie for her bottom courgette! Dave Jones for his reclining carrot! Paul Mitchell for his marvellous marrow! And Pete for his nobbly potatoes! Our wonderful Land Girls: Audrey Burgess, Nancy Cooper, Iris Faukes, Jessie Hall, Terry Hall, Hilary Hindley, Mary Paine & Margaret Simmonds– you are our inspiration! Our wonderful volunteers – Rosie Ryder & Bill Jones for being our wonderful bride & groom, Mark Ewins our terrific vicar. To Paul Mitchell, Martin Foster, Martin Kenny, for all of your invaluable help across the weekend – we couldn’t have done it without you! Our In Stitches Group – thank you so much for all of your hard work in creating the beautiful wedding dress and for supporting us on both days! NashWhite Hair – thank you so much for squeezing us in to do our lovely bride’s hair, she looked beautiful! Ursula Russell & the Holy Trinity Players – thank you for supporting this event with amazing costumes for our photobooth. Graham Beard – thank you for all your help in putting this exhibition together; for lending us the wonderful artefacts & stories of your wonderful mother, former Land Girl Phoebe Beard. Thank you also for the costumes to make sure we all looked the part! Chris Bradley – thank you for capturing all of the days special moments and turning it into a film. 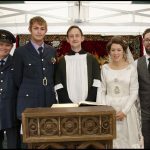 Zoe Skinner & the RSC Props department – a massive thank you for supporting the event with props & memorabilia to help us recreate a World War Two wedding venue. Second Thoughts Theatre at the Bear Pit – thank you so much for your incredible performance over the two days – you were brilliant at it meant a lot to our lovely Land Girls! Phil Williams – thank you for taking such beautiful photos to commemorate the day. 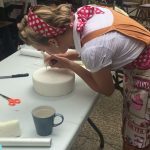 Molly Allen at MillyMollyMandyCakes – thank you for leading our World War Two Bake Off and supporting the event by making a beautiful faux wedding cake with our Clifford Chambers community group. Clifford Chambers & Wyevale Garden Centres and Four Teas – thank you for sponsoring our Wonky Veg competition! And of course, last but not least, a massive thank you to the community of Stratford-upon-Avon for supporting this event and your continuing support of us and what we do. Thank you!